The Magic Kitchen 12 in 1 Kitchen Tool is the new way to make kitchen work quick and easy . 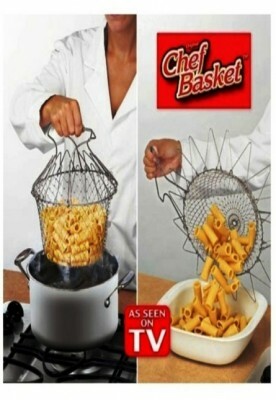 It starts off flat and instantly expands to a flexible basket that lets you cook, boil, or deep fry foods with ease. Even when hot water or oil is rapidly boiling in the pot, the specially designed handles stay cool to the touch. So you can safely lift out the Magic Kitchen Tool and go right from the pot to the plate. No more pouring boiling water into a wobbly colander. Cook pasta, shellfish, veggies, fried chicken ... virtually anything! 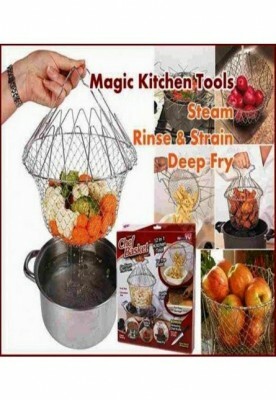 Price of deal is inclusive of FREE normal postage Made from stainless steel wire Can be used to cook, deep-fry, boil and more Invert it to be used as a steamer, flip down the handles and use it as a strainer or colander Suitable for vegetables, pasta, seafood, meat and everything else Handles are specially designed to be cool to the touch even if the basket is immersed in hot water or oil Collapsible for easy storing! 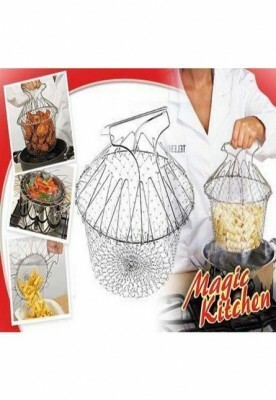 Use for deep frying, steaming, boiling, and cleaning vegetables Cook pasta inside the Magic Kitchen, lift, and transfer directly to the plate Can also be used as a freestanding colander for rinsing and straining potatoes and other vegetables Handles stay cool even when plunged in hot water or oil Folds flat for easy storage 12 in 1 kitchen tool Solid steel Dishwasher Safe Folds flat for easy storage Package Dimension: 25 x 27 x 3 cm.